NOTE: 1 oz. of product treats 6 gal. TK7 Super Power Booster for gas engines eliminates premature cylinder detonation (“knocking”) with any octane fuel, and increases horsepower. TK7 is the perfect substitute for lead in gasoline. It can be used safely in older model cars requiring leaded gasoline, eliminating the VSR (Valve Seat Recession) that was previously controlled by the lead. As a result of using this TK7 product, a synthetic lubricant is produced in the upper cylinder which reduces bore, ring, and valve wear by up to 600% and valve recession by up to 360%. 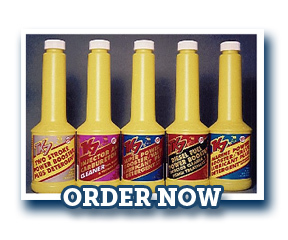 TK7 Gasoline Formula is safe for leaded and unleaded vehicles. It will not harm catalytic converters or any emission system components. This TK7 product does not contain MMT or petroleum distillates, both of which are commonly known as fillers or inert ingredients. It also contains a safe, high temperature detergent for fuel injectors, a carburetor cleaner, and a fuel system conditioner. On average fuel mileage is increased by 14% while emissions are dramatically reduced. Complying with the new ecology standards, all fuels contain a 10% ethyl alcohol (ethanol) content. The addition of this alcohol reduces the lubricity while absorbing moisture. This combination causes added corrosion of aluminum components in the fuel system increasing engine wear. These new standards caused the lubricity in fuel to be reduced by 77%. As a result of increasing ethanol content and reducing lubricity, premature pump, injector, and cylinder component failures will increase. TK7 Gasoline Formula is needed now more than ever. Bottle – 5oz., Easy Fill Bottle – 16oz., Gallon – 128oz., 55 Gallon Drum – 7,040oz.